During daylight hours, your property will be receiving solar radiation from the sun. The purpose of a solar PV installation is to utilise this natural energy and convert it to electricity. 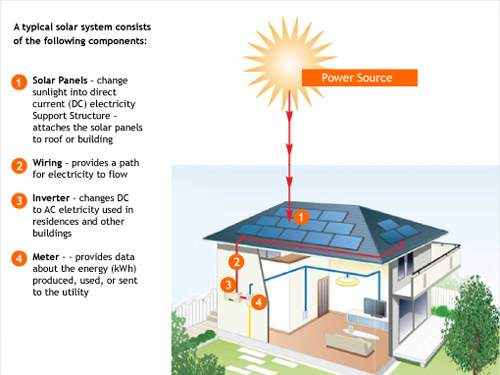 The typical components of a solar energy system are shown in the diagram below. Once the energy has been through your generation meter, it will be available for use in your home. If you have an appliance switched on, then the electricity that you have generated will automatically be used to power it. Any shortfall in energy is bumped up from the grid and any surplus energy is exported. For more details on exporting energy see the ‘Get Rewarded’ page. On a cloudless, sunny day the energy reaching the panels is known as direct solar radiation (i.e. sunshine). Even on the cloudiest, wettest days of winter the installation can still generate as indirect/diffuse solar radiation (usually refracted by clouds etc. ), will still reach the system. Direct radiation will obviously result in better generation than indirect radiation. Your location in the UK will also affect your generation – for more information, see the ‘Is my home suitable for solar panels?’ page.